It’s a funny thing being a mother. When Mothers Day arrives you naturally feel like you’re owed the most spectacular time in reward for your outstanding service to your dear children and all that selfless hard work you put towards them day in day out …sprinkled with lashings of love - obvs. However when Fathers Day arrives many of us seem to lack the same amount of enthusiasm. Shame on you (or me at least) but it’s often this way. Us mothers feel like we have it hard. Saying that we mostly feel we’re the Major Generals of our own army and nothing gets done without our say so. Soooo all the more reason I felt this year to reward the wonderful father of my children for the often unnoticed but vital part he plays in our family. Because I can! So after a long hard think and dash around the internet I found something really quite special. The fabulous St. Regis hotels and Resorts have launched a limited edition swim trunk collection with the ‘father’ of all swim trunk brands, Vilebrequin in…. wait for it, a matching father and son print. Matchy-matchy (as Anna Wintour once coined the phrase) eat your heart out! How perfectly adorable, and even better there’s only one catch - you have to fly to one of their resorts to get it and enjoy the ‘Family Moments’ package, the plan being you include yourself in this Fathers' ’treat’ - not so adorable any more, just down right genius. I could hear myself literally L.O.L’ing as I booked it. 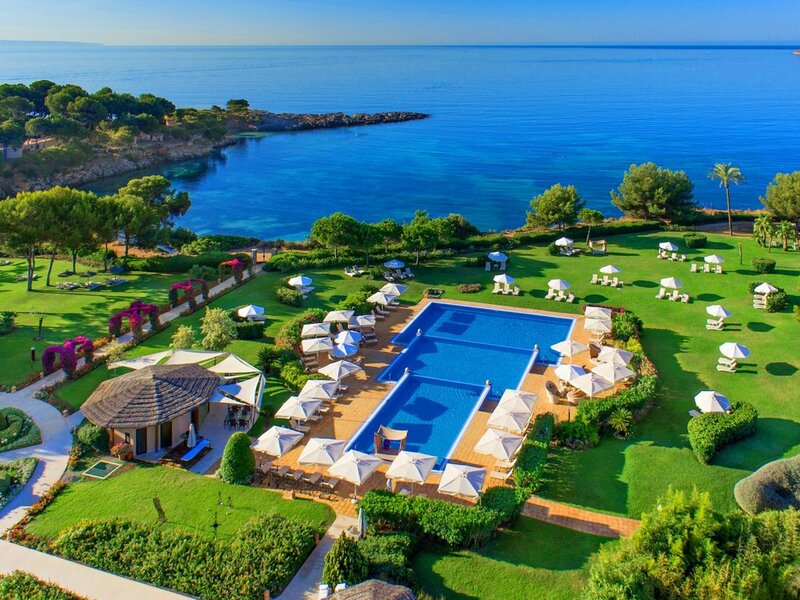 My choice of destination was the St. Regis Mardavall, Mallorca. It’s sunny, its hot and its only 1 hour and 50 minutes from the UK - basic math when planning a trip with children. Plus it’s had a stylish redesign with totally adult-child friendly amenities from a Kids Explorers Club and several swimming pools and a beach right through to the excellent Arabella spa and Michelin-starred restaurant, Es Fum. That’s me sorted. Sorry, both my husband and myself as part of this oh-so relaxing treat with our lovely, well behaved children that never ever scream or demand anything from us at all. Yeah right! I think they’ll be locked up in the Kids Club for the majority of the trip. Don’t judge. Back to the swim trunks. Rocco, my son, already has 9, so this is a collectors item moment for him. Nice father and son touch / bonding experience I thought. As his first pair of iconic Vilebrequins he’ll be donning the Red Snapper trunks, (spinning off the celebrated 1934 St. Regis New York Bloody Mary cocktail nicknamed ‘Red Snapper’ of which I’ll be sinking many) along with my husband, of course. Wouldn’t want to forget about him in all the excitement! From the Maldives to Bal Harbour to Bora Bora, take your pick of where you’d wish to enjoy this experience and get those exclusive Viberequin Red Snapper trunks on your husbands and sons whilst frolicking on any of these accompanying beaches and pools, preferably whilst you watch, cocktail in hand. It’s the ultimate holiday keepsake, and in my case, Father’s gift, at any time of the year. So here’s to my husband, he’s father of the year every day, so long as I can come along for the ride. Cheers darling!